First I would like to stress this is not my pattern. I in no way wrote it. The charts I offer here reflect my mods. They do not give instruction to make the pattern. I suggest downloading the actual pattern than using these mods if you want to. I am making this post because I did quite a few modifications to the pattern and also charted my bead placement. I thought it would be good to explain what I did. 1st. the body of the shawl. 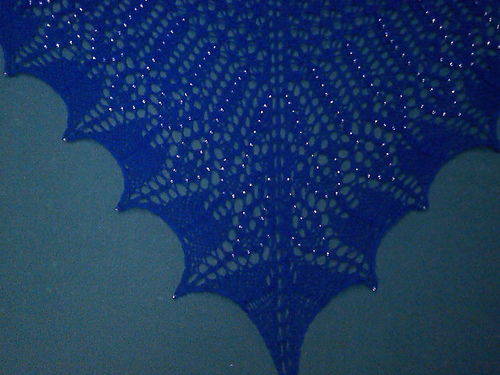 This was a traditional Shetland lace. the original has all the decreases leaning the same way so I mirrored them. this is the same stitch pattern used in Rock Island. The charts are mirrored on both sides so I eliminated the 2nd half of the chart so it would print larger. 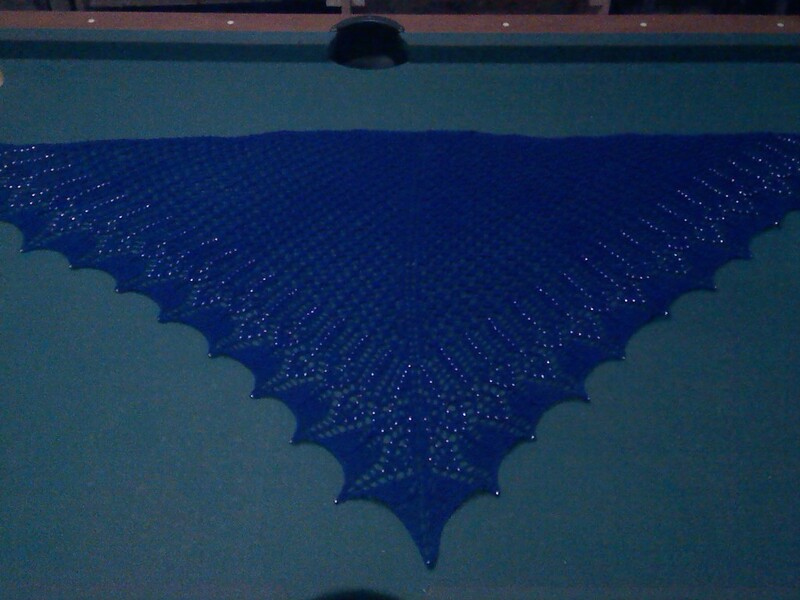 This is what I have for the body of the shawl. If you want to use lifelines in this portion of the pattern I would suggest inserting them on any double decrease row. these rows have the most stitches which makes it easier to pick up off the lifeline if needed. for the most part I used the later so this created straight lines of stitches with a lined up stitch on top. I did use the 1st version at the tips of the arrows to allow them to come to a clear point. I also moved the decreases from the center of the arrow to the edge to better accent the lines of the arrow heads. Again, this chart is mirrored so you don't need the other side, this allows for larger printing. I also changed the order of the charts on the page so better see how the pattern repeats lined up with each other. The highlighted stitches are where I placed the beads I worked the stitch and than removed the loop and slipped a bead onto it before placing it back on the needle. This bead placement does take a LOT of beads! But I think it's worth it as it really brings out the arrow pattern in the edging. I placed a bead at the tip of each point. I also worked the bind off in pattern. It calls for a stretchy bind off so I worked the one where you make 2 stitches and than knit them together. But I worked the 1st stitch in pattern. k2, slip back, k2tog (place bead on loop), yo, pass last stitch over the yo, *k1, slip back and k2tog* [repeat 4 times). ssk, slip back and k2tog, *k1, slip back and k2tog* [repeat 4 times]. yo pass last stitch over yo, k1, slip back and k2tog (place bead), yo, pass stitch over yo. Basically I worked the 1st stitch of the bo edge as though it were another pattern repeat than I bound it off with the last stitch I had on the needle. I continued on in this same fashion. It's not necessary to do this, but I liked carrying the decreases to the edge. Beads... beads... this has a LOT of beads! for the body of my shawl I worked 7 repeats. this gave me 36 full arrows along the edge 576 beads than another 70 for the increase arrows that resulted from increasing on the points. The edging took 25 beads for a grand total of 671 beads. My beads are small and I used a size 13 crochet hook to place them on. Another method is to string them onto a beading wire than fold the end of the wire. hook the loop of the stitch with the bend of the wire and put the tip of the wire back into the bead and push the bead down onto the stitch.